UPDATE: This event has been postponed to next Friday, Sept. 19 from 6 – 8 p.m.
Former WITS writer Ann Walton Sieber’s year-long collaboration with photographer Ben Tecumseh DeSoto will debut this Saturday at 6 p.m. at DiverseWorks. “Understanding Poverty” is a documentary project focusing on the homeless of Houston. The project will be on display at DiverseWorks from September 12 – November 1, 2008. The following information is an excerpt from the DiverseWorks website. Making our way to work in the everyday stress and hubbub of a Houston Monday morning, we drive up to one of downtown’s busy intersections and see a homeless man holding a plaintive sign. We don’t know his name, but we know him from other days at the same intersection, his disheveled appearance familiar as he ritualistically waits at the crossing every day, hoping someone will give him some money for food or who knows what. As we pull up to the light, our eyes meet. But we quickly break away from his gaze and fixate on the traffic light. Or perhaps we keep his gaze, wondering, what is his story? The light turns green; we cross the intersection, the man a reflection in our rearview mirror. 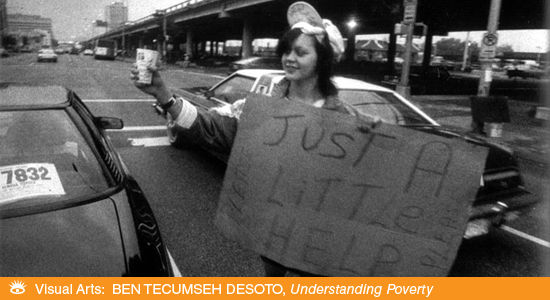 Drawing on his many years of documenting Houston street life, photographer Ben Tecumseh DeSoto tells the stories of the homeless and working poor, the “broke and the broken.” Understanding Poverty, which is presented in symphony with text by Ann Sieber, will kick off DiverseWorks 08-09 season with an opening reception on Friday, Sept. 19, 2008. When: Friday, Sept. 19, 6-8 p.m.